2017 was a big year for website design, even with business websites we noticed a move towards more open layouts leaving grids behind, bold typography and colours, mixing horizontal and vertical text, more illustration and geometric shapes with overlapping text plus loads more. It’s wonderful and trends are great to follow for inspiration but web design is constantly evolving. 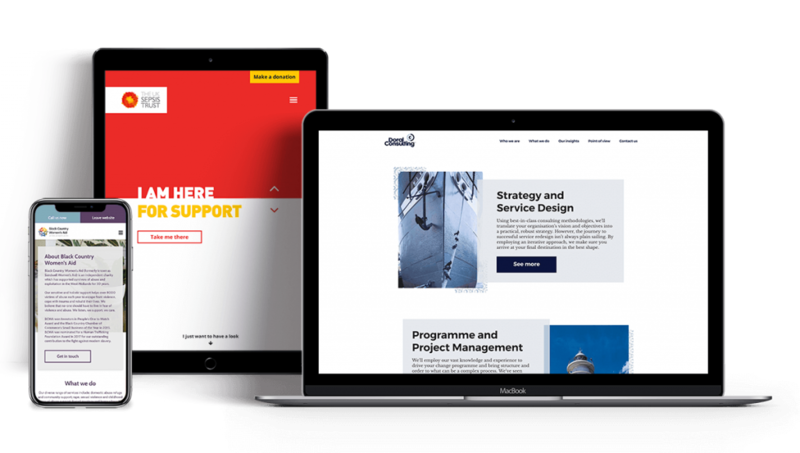 More important than trends and following ‘what’s in’, we believe that a strategic approach to website design and having a website that’s as unique as your business is vital to success. What do we mean by a website as unique as your business? Well, we’ve spoken to a lot of businesses lately who are unhappy with their current business website. When we dig in we find that it doesn’t fit their business, it isn’t flexible enough to be a marketing platform and basically falls short in all aspects of performance. When we dig a little deeper we often find that these less than mediocre websites are templates or bog standard design themes that have been set up on and their brand and content shoehorned in. Your business is online so what does it matter right? Well, have you ever thought about the antique business? Why do people spend over the odds on a vase, books or a clock? The reason is that the item is unique, it’s one of a kind, it’s special. Your business has something special. Whether you’ve created something that’s really innovative, something that is super useful and makes your customers’ lives better or something that’s honest and good – whatever it might be, to give it justice your website needs to be as unique as your business. How do these design principles relate to your business website? If there’s something in your product, service, process, approach that’s innovative and creates an advantage for your business, your website should celebrate this. A custom design that’s inspired by your innovate will help to represent you online when you’re not there to. Is your product or service useful? We’d hope so or you wouldn’t really have a business. The point is, if providing some sort of usefulness to people whether through functionality or aesthetics is what your business is founded up, then having a business website that disregards that could detract from it. Make sure your website design is in line with your competitive advantage. Do you think we’d all use Google if it wasn’t as simple to use? Is your product aesthetically beautiful? Whether it’s a Breitling, a car, a phone or a house – people wouldn’t part with their hard earned money if they were ugly ducklings would they. Humans are visual creatures, aesthetics are important to make sure your website design isn’t a turn off before people have even had a chance to know you, try your product, taste your burger or whatever it might be. Whatever one, two, combination or all of these principles are important to the design of your product or service, they have got to be reflected in the design of your business website. The way you achieve that is through custom design, crafting something that’s as unique as your business.